Wall Street loves an anniversary and the 10th anniversary of the Lehman Brothers failure was no exception. We won’t go into the causes of the failure and subsequent Great Recession as they have been told and re-told many times. One lesson of Lehman was that anything was possible in terms of financial calamity, so what does that mean for investors today as we hit new high after new high in the stock market indexes? A strain of thinking since the bankruptcy of Lehman has been that another economic/financial collapse is imminent (similar to doomsday prophecies). Adherents to this thinking cite the following: asset prices are at new highs, the Fed is raising interest rates, the US economy is booming and there are many global tensions that could erupt into open conflicts. Could we experience another calamity? Of course, anything is possible. But successful investing deals more with probabilities. The financial system is considerably safer today as a result of stricter capital adequacy requirements for banks, as well as a regulatory regime that is far more alert to risk (ask any banker). As things stand, another Lehman is not probable. What may be an even greater safeguard for the markets is the tendency by investors to remember the most recent event and expect that event to occur again (also known as the Recency Effect). Lehman may end up being the most significant financial crisis of our lives and for many it will seem like yesterday if Wall Street suffers another bout of volatility. As a result, investors are less likely to surrender to euphoria and forget risk as evidenced by the back-to-back tech stock and housing bubbles of the first decade of the 2000s. *A flattening yield curve means short-term interest rates are nearly the same level as longer-term rates. Prior occurrences have preceded most economic slowdowns. Overall, we believe the positive factors outweigh the negative. 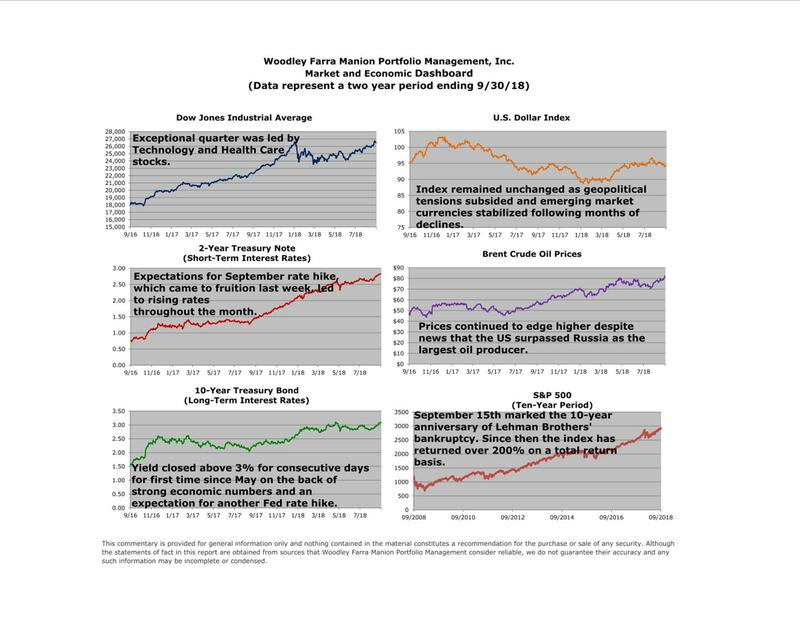 We do expect a good finish to 2018 since the fourth quarter is traditionally a good period for stocks.